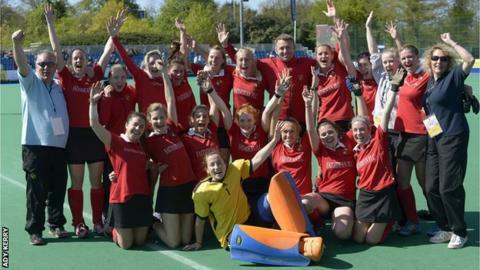 Holcombe women coach Kevin Johnson praised the attitude of his squad after they won promotion to hockey's Premier League at the weekend. The Medway club came through the play-offs to seal a place in the top flight. "The club has always had a vision to have a Premier League team and everybody who has joined has come with a work ethic," he told BBC Radio Kent. "We are thrilled to be dining at the top table and will just soak up the experience next season." Holcombe secured promotion with an emphatic 8-2 victory over Brooklands Poynton at Reading HC on Sunday. The Rochester-based outfit will take their place in the top tier next season alongside Buckingham, who were also promoted through the play-off tournament. "I'm chuffed and thrilled for the squad as they have worked exceptionally hard all season," Johnson added. "The progress has been so accelerated it has been unbelievable. Last year we weren't even a National League side and suddenly we are approaching a Premier League season." Holcombe, who have been playing in the second-tier Conference East this season, were criticised earlier in the campaign for their recruitment strategy of bringing in high-profile players. England internationals Maddie Hinch and Laura Unsworth were among those to join the club and the latter is looking forward to the challenge next season will bring. "We weren't expecting to do so well as this was our first season in the National League," 26-year-old defender Unsworth told BBC Radio Kent. "We have got to go into the Prem with no fear. I have spoken to a few of the Great Britain girls and I think the top teams are looking forward to playing us. "There is a lot of talk about Holcombe and people want to play us." Johnson has backed his squad to make the step up to the Premier League. "We knew the players we brought in could play in the Premiership so that was a bit of forward planning," he said. "The girls have all linked in with the ethos of what we are trying to create and have been paramount to the team spirit."